FONFA was well represented again this year with a stand at the important Lyndhurst Volunteering Fair, at the Lyndhurst Community Centre, on Sunday 28th January. Over forty community organisations attended and several dozen visitors stopped by to chat with FONFA Trustees and learn about FONFA, our new Museum at Bransgore and the memories we hold in trust, for future generations. 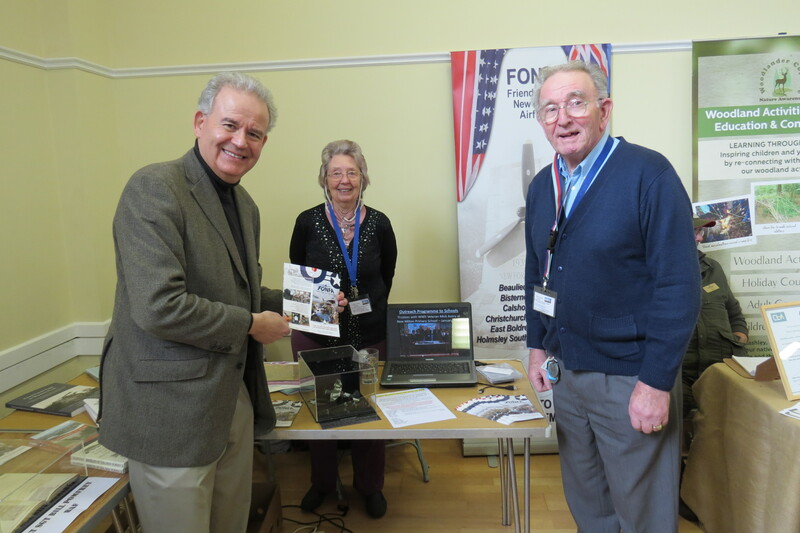 MP for New Forest East, Dr Julian Lewis, pictured here (left) with FONFA Trustees Lynn Coirbin and John Brooks, was one of the dozens of visitors who were interested in the history of the New Forest Airfields and our display of model dioramas, depicting aircraft that flew from the Forest in World War II. Chair of Trustees, Dr Henry Goodall and fellow Trustee, Charles McKenzie, were also on the stand, speaking with many new contacts and networking with other New Forest Voluntary organisations.